18 25/04/2019 05/05/2019 £869.40 On sale! Travel to the Finger Lakes region, and take in the natural beauty of the area. Opt to cool off in the lake, or sample wine from a local winery. Visit towering Taughannock Falls, before travelling to Niagara Falls. Get wet on the Maid of the Mist boat tour and be sure to check out the falls illuminated in the evening. Drive along Lake Erie, through the city of Cleveland before continuing on to Detroit. Detroit is having a resurgence and is quickly transforming with new markets, distilleries, art galleries, and restaurants popping up. Enjoy a free afternoon to explore this up-and-coming destination. Continue west to Chicago. There's tons to do in the Windy City – walk along the river to Millennium Park, enjoy dazzling music, and stroll the boardwalk of the Navy Pier. Opt to ride to the top of the Willis Tower, or hit the town for a night out with the group. Follow the Kentucky Bourbon Trail to Louisville. Home of the Kentucky Derby, this city is a foodie haven filled with lively bars and farm-to-table restaurants. Enjoy a free afternoon to explore, and don't forget to indulge in some BBQ and bourbon. Travel to the country music capital of the world. Head out for live music, line dancing, and cowboy nightlife tonight. Keep your eyes peeled for some of country music's biggest stars. Enjoy a free day in Nashville. 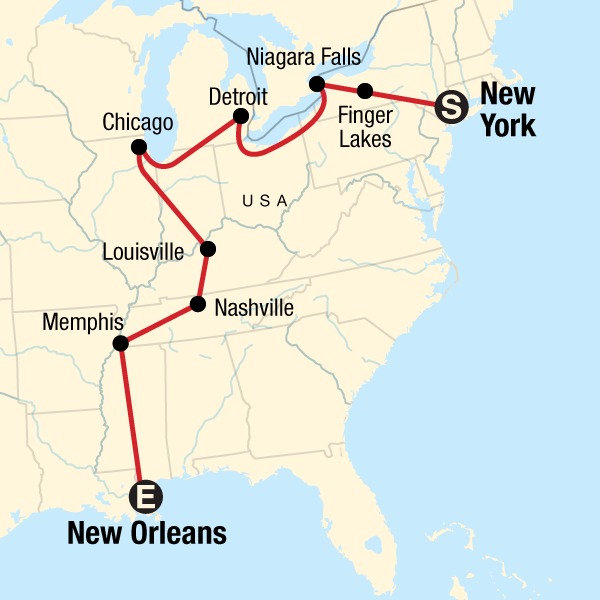 Opt to visit the Country Music Hall of Fame, Johnny Cash Museum, or take in live music along the "Honky Tonk Highway". Explore the vibrant cultural and musical melting pot of Memphis. Take an optional tour of Graceland, opt to relive history at the National Civil Rights Museum, or tour the Rock 'n' Soul Museum. Head to Beale Street at night for great food and live music. Crank up the jazz and drive into the home of Mardi Gras. Trip ends upon arrival to New Orleans. Opt to explore the French Quarter, and join the revellers on Bourbon Street till the early hours.